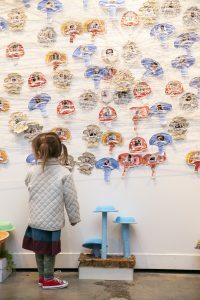 Envisioned by DC-based artist Naoko Wowsugi with partner Enough Pie, this 10-day installation was collaboration with local artists Mikki Blackman and Deborah Donovan Rice, Cara Ernst, and teachers & students from multiple local schools in Charleston’s Upper Peninsula. 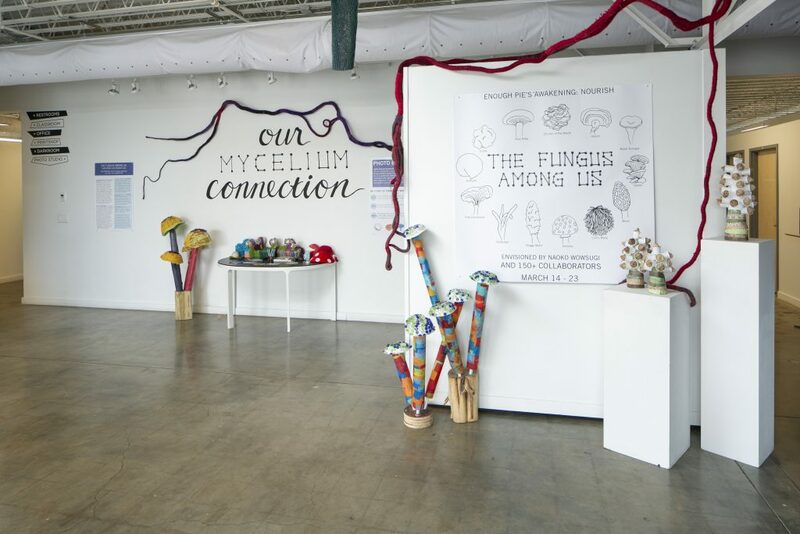 THE FUNGUS AMONG US: Our Mycelium Connection was part of Enough Pie’s AWAKENING: NOURISH, a series of artworks and events showcasing creative ways to nurture ourselves and our communities through food, stories, and artistic expression in Charleston’s Upper Peninsula. For this initiative, a mushroom focused immersive art experience was constructed to illustrate the connection between humans and how that is similar to the interconnectivity of a mushroom’s root system. The main gallery at REDUX was split between light and dark, a metaphor for the Spring solstice. A mushroom needs light above ground to grow, and darkness below ground, where its roots communicate in exceptional ways. Throughout this installation, Naoko Wowsugi participated in Redux’s new Visiting Artist Pilot Program, working out of Redux during her short-term residency in Charleston actively engaging with studio artists and the Upper Peninsula community. 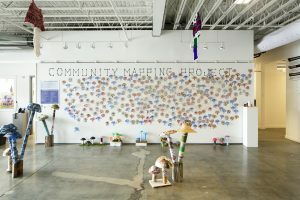 COMMUNITY MAPPING PROJECT: The light side of the gallery was covered with mushroom sculptures created by local students to showcase a community mapping project. Participants took their photo with a polaroid camera and connected their image to the photos of people they know that are already on the wall with string, which represented the connections between people with the hope that people see how interconnected we are to people we have never met before. Mycelium, the technical term for mushroom roots, grow underground and connect to other organisms in fascinating ways, just like community members connect to each other in ways they may not realize. MYCROCOSMOS: The dark side of the gallery was a meditational mushroom planetarium. 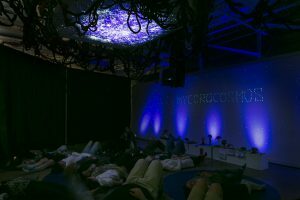 Visitors were invited to lay on the ground and look up at a textured ceiling of fiber mycelium. Looped and netted cords and wrapped coils were created by the textile artists Mikki Blackmon and Deborah Donovan-Rice, along with a local community knitting group to create a theater screen, and a video featuring “mushroom fairies” (a nod to fairy rings) played regularly featuring interviews with local experts to share the important and interesting role mushrooms can play in the future of humanity. WHY MUSHROOMS? The power of mushrooms is multifold. Mushrooms can be an important food source for humanity moving forward as they contain significant protein & high nutritional content, and can be a substitute for meat, which emits high carbon levels into the atmosphere during production. Mushrooms are amazing at detoxification, removing harmful toxins from soil and water. The way mushrooms communicate and build strong structures is a fascinating metaphor for how to make healthier communities and build better communities, a process called biomimicry. Humans can learn so much from FUNGUS AMONG US!